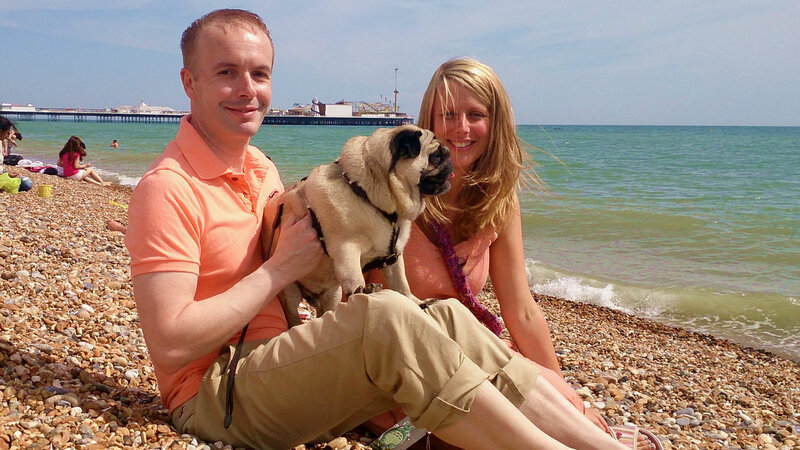 Even dogs seem to prefer the summer – wanting double the walks per day. 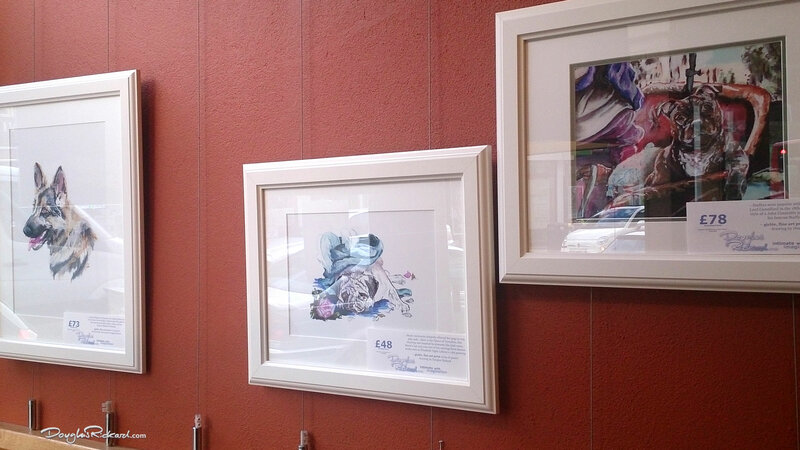 And I displayed double the art at my dog drawings exhibition in Muswell Hill, London. Halfway through, I changed out my charcoals to color, by unleashing some oil pastel art. 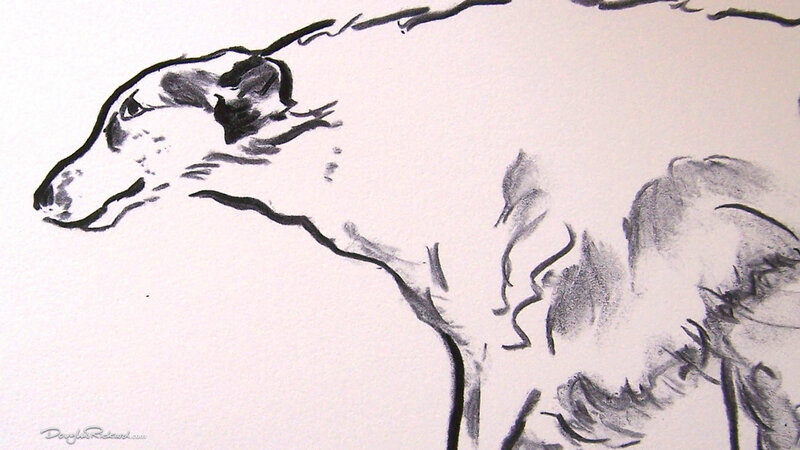 Despite using sometimes only minimal markings, a friend who came to visit, kindly praised my charcoal drawings for still capturing the dogs’ personalities. 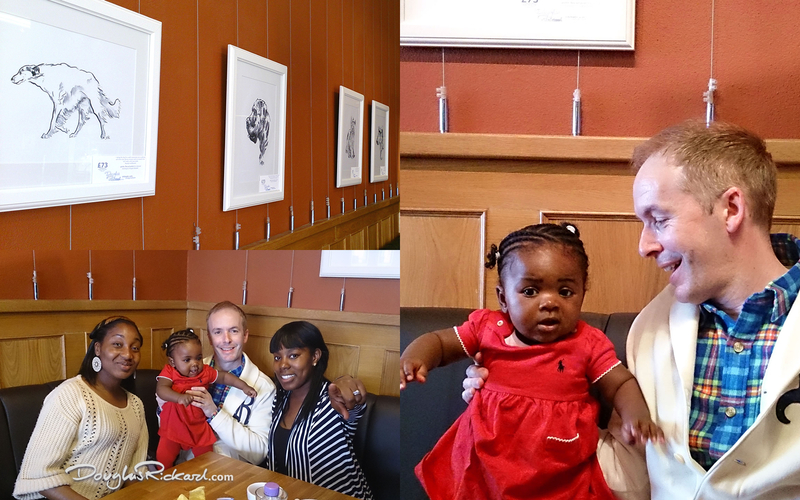 It was rewarding to get to see a room full of just charcoal giclée prints too. The larger versions, 13” x 19” sizes of the German Shepherd, dachshund, whippet, bulldog, French Bulldog, poodle, Staffordshire Bull Terrier, Chihuahua Mix, Yorkshire Terrier and boxer greeted everyone at La Miel café with a bright and brawny show. 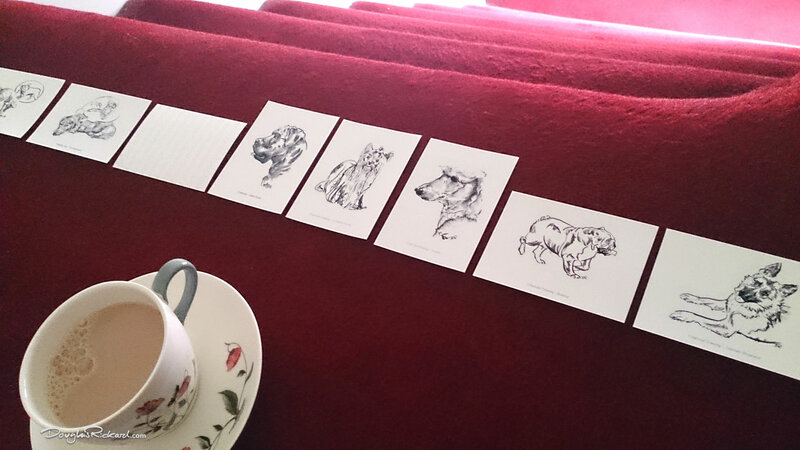 I débuted two new dog drawings, at my exhibition, of the Cane Corso and the Borzoi. The more I create dog drawings, the more I’m astounded by these much doted upon denizens of Creation. Who would think the Cane Corso would have the protective traits of a children’s nanny. And what about the Borzoi behaving a little like the family cat? If it weren’t for a friend of 27 years from back in art college, who plumped on buying a pug (before getting pregnant,) I wouldn’t have been drawing dogs at all. 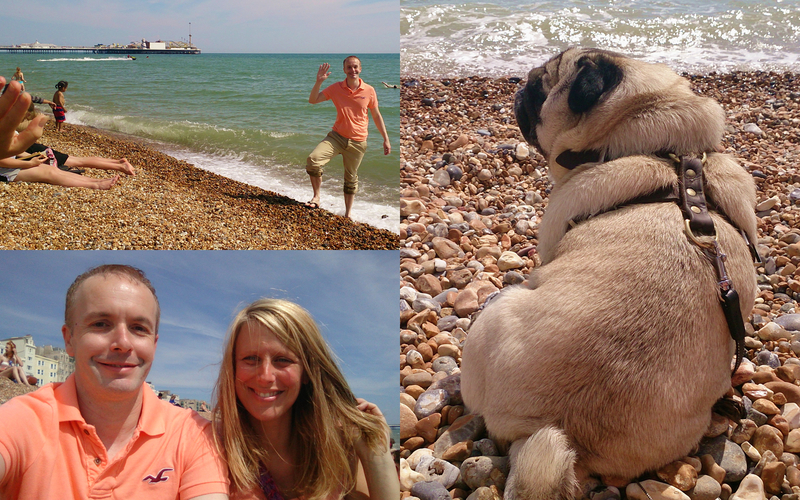 I met up with Gizmo, and my friend and her boyfriend on a day trip to Brighton. And in this video (below,) I’m amazed again, this time, at how a little dog who hasn’t seen me in months, could recognize me as I arrive at the station among dozens of people. 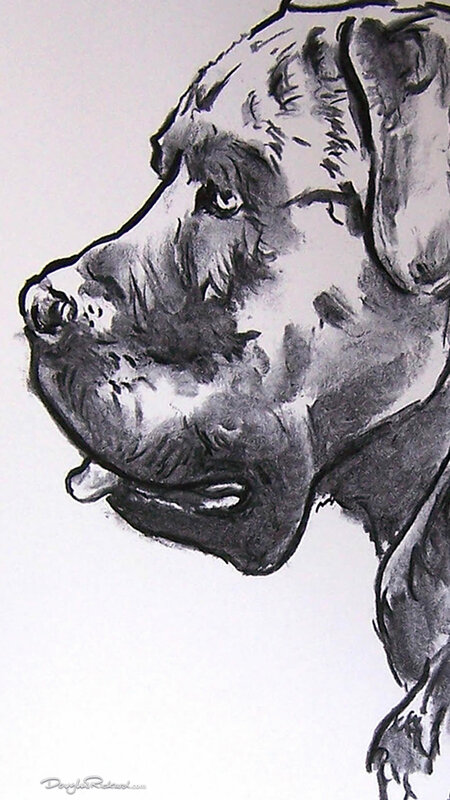 So whether it’s black and white or full color drawings like those of the German Shepherd, Staffordshire Bull Terrier, Chihuahua, pug, Yorkshire Terrier, boxer and Doberman – there are plenty of dog days of summer left to buy some pedigree art! 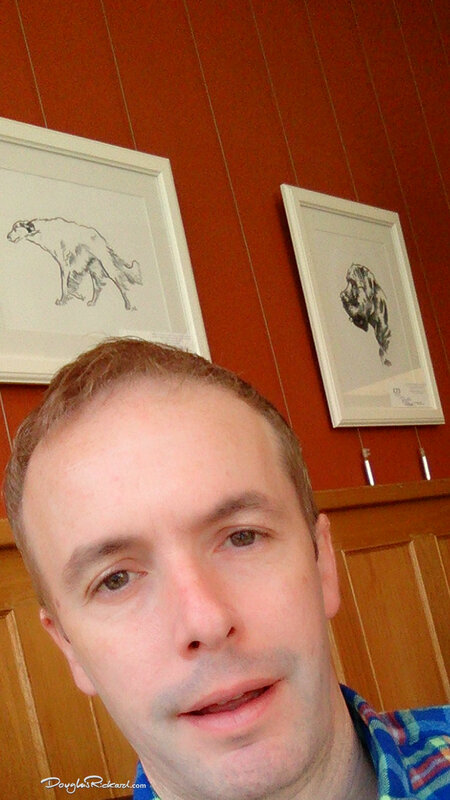 This entry was posted in Art, Dog Drawings and tagged "Douglas Rickard", Borzoi, Borzoi drawing, Brighton, Brighton beach, Bulldog, Bulldog drawing, Cane Corso, Cane Corso drawing, DOG ART, dog art exhibition, dog drawings, French Bulldog, French Bulldog drawing, German Shepherd, German Shepherd drawing, London artists, Muswell Hill, Muswell Hill London, Poodle, Poodle drawing, Pug, Pug drawing, Pugs at the beach, Staffordshire Bull Terrier, Staffordshire Bull Terrier drawing by Douglas Rickard. Bookmark the permalink.